Childhoods are formative times and need to have a good balance of imaginative, social, and physical play. 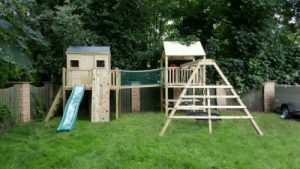 This combination of play house tower; with slide, swings and social play ticks all the above boxes. Creating a neat and attractive package, for kids of all ages to enjoy. The centre of this climbing frame is the play house. A fully enclosed and weather tight construction ideal for tea parties, sleepovers and den making. Its glazed with a door, which enables play throughout the year. Access to this private space is via a step ladder or from the bridge uniting both towers, or up the climbing wall for the more athletic children. Getting down is the easy bit – just take the wavy slide. There’s also space below the platform, whilst not fully enclosed, will protect the kids somewhat from the elements. The second tower is no slouch either when it comes to providing thrills; it has a roof and an open platform from which budding royalty can survey their domain. Getting back to the play house tower is simply a matter of walking across the bridge. It’s not for the faint hearted, as it’s several feet off the ground but perfect for giving confidence and is perfectly safe. Below the platform is a protected picnic table for those all important social occasions. 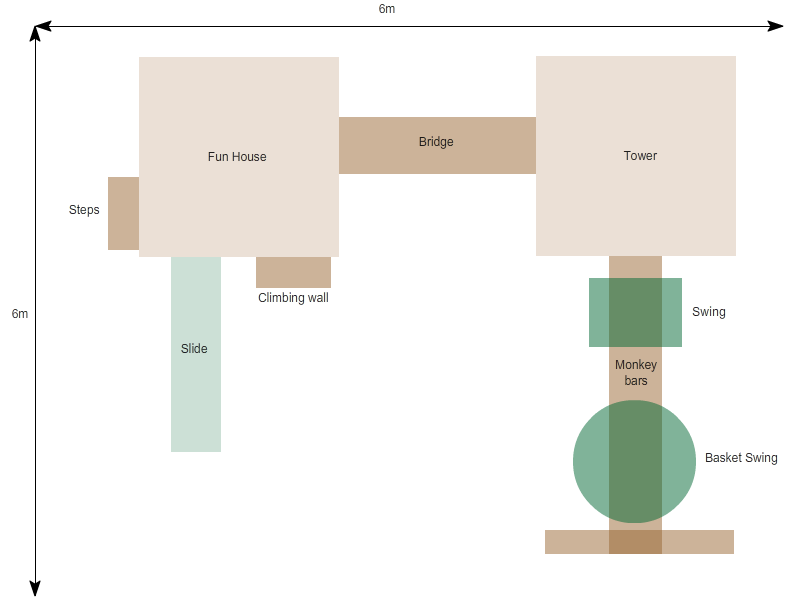 And for the keen swingers, there’s a set of monkey bars extending to an A frame which houses a climbing frame and swing set. In this instance, it’s a sociable nest swing with traditional toddler swing, making this kit suitable for even the younger type of user. However we can attach whichever swing seats you prefer, so when you call us, just ask. All-in-all there’s an enormous amount of fun and frolics to be had with this winning combination. Its something that will not only last them many years, but has the capability of evolving as your children grow up. All our timber is sourced from sustainable suppliers, is pre-treated softwood primed for outdoor use and guaranteed for 10 years. This climbing frame is constructed with Square timber.